The space and freedom of a seven-passenger SUV in a sleek and stylish vehicle. A family SUV that puts the focus firmly on luxury, the RX L is elegant, spacious and engineered to make sure every passenger is pampered and protected. This versatile addition to our luxury SUV range features three-rows and enhanced cargo capability while still retaining the stylish figure that characterises the RX SUV. Its dramatic mix of sharp creases and curves is characterised by our Lexus signature spindle grille and an elegant chrome-plated surround while the interior features a precision designed cabin and innovate technology that can be tailored to your style, letting you create the RX L you deserve.EXPERIENCE THE RX LWith exceptional handling and fuel efficiency systems as standard, the RX L gives you a driving experience that far outstrips expectations for an SUV. Versatility and spaciousness are beautifully presented by its coupé-like concept, fluid silhouette and impeccable cabin craftsmanship, giving you a stylish, sporting family vehicle. With exceptional handling and fuel efficiency systems as standard, the RX L gives you a driving experience that far outstrips expectations for an SUV. Versatility and spaciousness are beautifully presented by its coupé-like concept, fluid silhouette and impeccable cabin craftsmanship, giving you a stylish, sporting family vehicle. Lexus has always pioneered the development of safety and driver support technologies, and tests all new models in the world’s largest driving simulator. Benefiting from our lead in accident prevention research, the new RX L is now fitted with the breakthrough Lexus Safety System + as standard equipment. 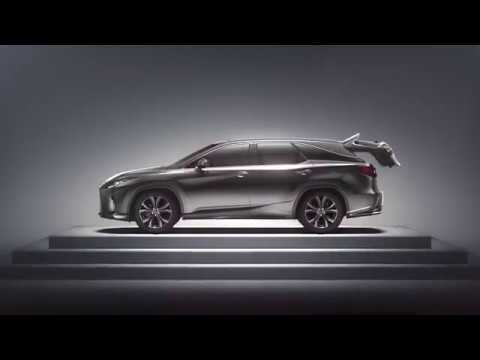 **1.9% APR Representative and £5,000 Hybrid Deposit Allowance only available on new retail orders of RX L between 1st April 2019 and 30th June 2019 and registered and financed through Lexus Financial Services by 30th September 2019 on a 42 month Lexus Connect (PCP) plan with 0%-35% deposit.